Sailing is a sport where feel is very important. If you are doing something wrong, the boat feels bad. We come to recognize these feelings and associate them with corrections. Over time, our set of corrective activities can become so in tune, that you can sail the boat without ever getting a bad feeling. That’s anticipation. People like to think that anticipation comes with practice of feeling the boat, which is partially true. But there is more than one way to handle each error detected. Without understanding the problem people sail from one error to the next, bouncing off of the extremes to determine the correct path. Maintaining optimal course upwind is like walking down a dark narrow hallway without bumping into the walls. People that do it well come out unscathed, while others requires using their hands to navigate the path. The only way we are fed different stimulus is through changes to helm in the boat. Weather helm makes the boat feel like it wants to head up, and lee helm when the boat wants to bear away. How you react can be the difference between maintaining top boat speed and errors that get massively amplified over a race course. Each of these situations has a different method of handling it and identifying them has very subtle differences. Developing a way of reading the wind on the water is the ultimate key to making the best judgement before your speed is compromised. Most people that have sailed their entire lives do this intuitively, but I’m always amazed at how many people when I ask “how do you know where the wind is coming from” repeatedly tell me “telltales or wind vane”. They have never trained their eyes to look at the ripples on the water. What is so telling about the water that you can’t see in the wind vane? Water tells you what is coming. Water doesn’t change when your boat changes. It isn’t affected by the rocking of your boat. Water you can see upwind and downwind. Water can give you ladder rungs, puffs, lulls, shifts, line bias, tacking and gybing angles. Looking at the water is like drawing a map of what could happen, whereas signs on your boat are an indicator of what has happened. Remember: any tool used on your boat will only show you a change in apparent wind that has already happened. The best example of this is people who struggle in light winds. Something I see commonly are people who in light wind cannot find optimal sailing angle. They are quick in the breeze because they love to sail with feel. In light wind there is no feel, so they go searching for it. If they get more pressure in their sails, they head up without questioning lift or gust. When they get high enough – too high, they pinch and go over flat. Losing power means bear away! Regardless of considering it as a lull or pinching. To their credit, they are sailing with quick reaction to the stimulus they have learned over years, but what they aren’t realizing is that without change in direction of the wind, there should be very minimal change in direction of the boat. 9 times out of 10, they are sailing through small pressure differences- that if they were looking at the ripples on the water, they could see that their optimal upwind angle isn’t changing. The boat is asking for an adjustment of weight, not course, or an adjustment of sail settings, not heading. As wind breaks the surface tension of the water, it makes small ripples. Over time and distance, ripples become waves. Even when there are waves, ripples will exist as long as there is still wind. 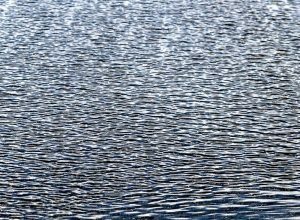 When wave direction is not lined up with wind, ripples can be more confusing or harder to look at. When trying to determine the wind direction by looking at the water, look back and forth across a horizontal plane about 10-15 meters long right in front of you. Try to see how the wind is making small 2-4 inch wide banana shaped curves. One curve connects to another almost creating clear horizontal lines. Using the index finger of one hand, indicate on this image where you think the wind is coming from. Notice how you have to look at the whole image several times to make sure all horizontal lines are consistent with each other. If you thought from the very top of the page that is correct. Now try to imagine using your hand as a pretend boat: what does close hauled angle on starboard looks like? Now find port tack. Picture a boat sailing straight downwind, then try to imagine what the boat would look like by the lee. You will notice the more you use your hand to find the right boat angles, the more you are looking at the ripples, creating a visual angle between the ripple lines and your boat’s sailing line. Seems easy enough to try? The most critical use of this is lighter wind. Next time you get a chance, go out and practice just watching the ripples. Not just in front of your bow but try to look several meters upwind and 180 degrees across the wind. Then try it downwind. See how the angles of the ripples approach your leech when sailing by the lee, then try to guess the opposite by the lee angle without gybing. Vaughn Harrison has worked with countless Olympians, youth and masters sailors. He coached at the 2016 Rio Olympic Games and founded ISA in 2008.